The 32nd annual EyesOn Design Automotive Design Exhibition will highlight "DESIGN AROUND THE WORLD - Design is Universal - to demonstrate differences of design by country and allow spectators to compare these designs within different vehicle types." the officially-sanctioned design awards of NAIAS, were presented on Tuesday, Jan. 15, 2019. "Proud to be named by USA Today as 4th on the list of Best Car Shows in the United States"
Ed Welburn selected as 2018 EyesOn Design Lifetime Design Achievement honoree, joining some of the most acclaimed designers in the world. Each year, EyesOn Design attracts members of the transportation design community, collectors, and the public to celebrate and reflect on design. Vehicles are chosen based on the year’s theme by invitation only, and between 200 and 300 vehicles are at the show on Father’s Day. Judging is accomplished by individual automotive designers and/or teams of exterior and interior designers from leading automotive and supplier companies. Mike Simcoe, VP - GM Design. EyesOn Design Awards are the officially-sanctioned design awards for NAIAS. They honor the best production and concept vehicles making their North American or worldwide debut in Detroit. The awards are prominently displayed in design studios around the world and are merchandised as industry validation of great design. The Awards are selected by active and retired design heads of automotive manufacturers and transportation design chairs from top art schools. EyesOn Design celebrates great design and the designers behind it. 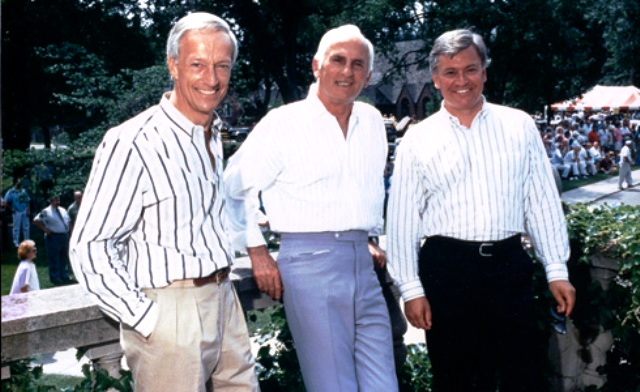 Jack Telnack (Ford), Charles “Chuck” Jordan (General Motors), Tom Gale (Chrysler) at the first Eyes On the Classics. EyesOn Design was founded in 1987 with the support of design heads of GM, Ford, and Chrysler as an automotive exhibition judged exclusively by automotive designers. Today, we celebrate design with an ever-increasing group of designers, collectors, manufacturers, suppliers, and the general public. 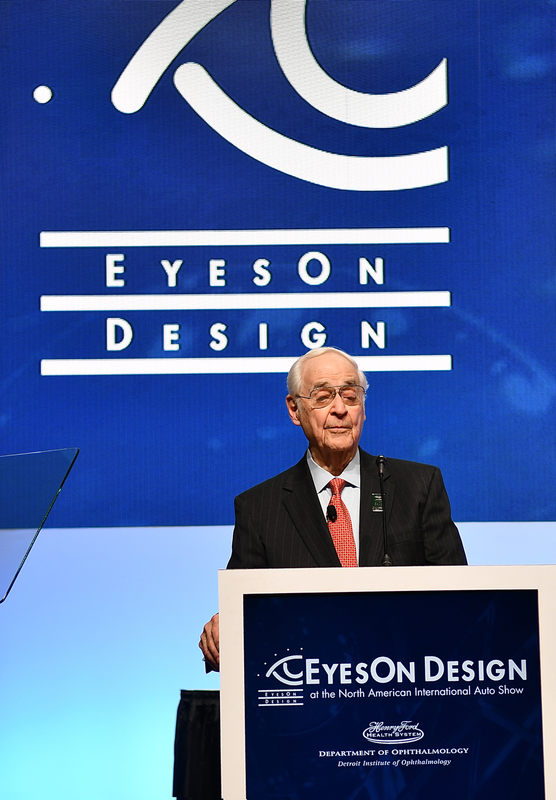 EyesOn Design has raised over $4 million for the Detroit Institute of Ophthalmology (DIO), the research arm of the Henry Ford Health System Department of Ophthalmology. The DIO supports the visually impaired and blind of southeastern Michigan and organizes two leading world research congresses. Design benefits vision and vision benefits design. The Detroit Institute of Ophthalmology brings together competing researchers to share their findings, critique each other’s work, and go home with new approaches. The Eye and The Chip, organized with Harvard Medical School, encourages collaboration between efforts to provide artificial vision to many people who are now blind. The Eye, The Brain, and The Auto improves our understanding of the relationship between vision and the safe operation of vehicles, in an attempt to reduce fatalities.